The Great Biosociotechnocosmos is the bulk of the 'Organic Film' growing and breeding on mother Earth. It does not include the surface of Earth for which it is its platform but materials from the Earth and its atmosphere are extracted, processed and transformed into the Great Biosociotechnocosmic System or the Great Biosociotechnocosmic Body through the actions of the Law of Three and the Law of Octave. 3. Technocosmic Octave (or Radation) which comes soon after the first two octaves started. One thing we must remember that each octave comes into existence as soon as the preceding octave comes into existence and only at the time or period when the preceding octave has matured or ripened and is ready for the incumbent octave. The incumbent octave comes as a ‘revolution’ somewhat like a qualitative transformation or addition to the existing octave. 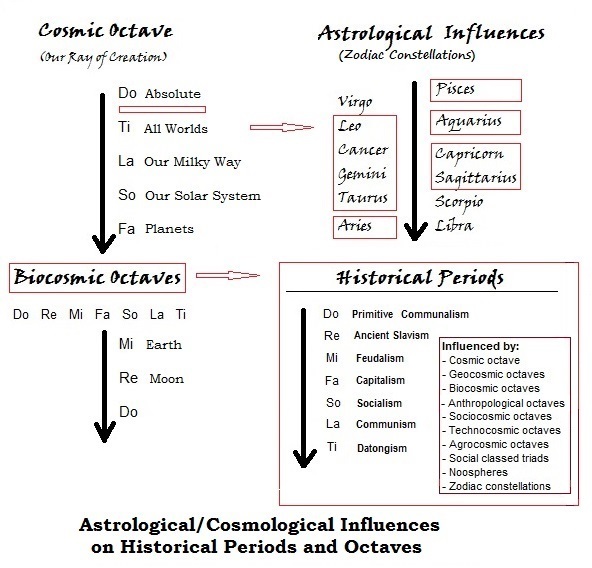 We are unable to do much in the original Biocosmic Octave as it comes much earlier than all the other 2 Octaves and still continues to evolve and involve. 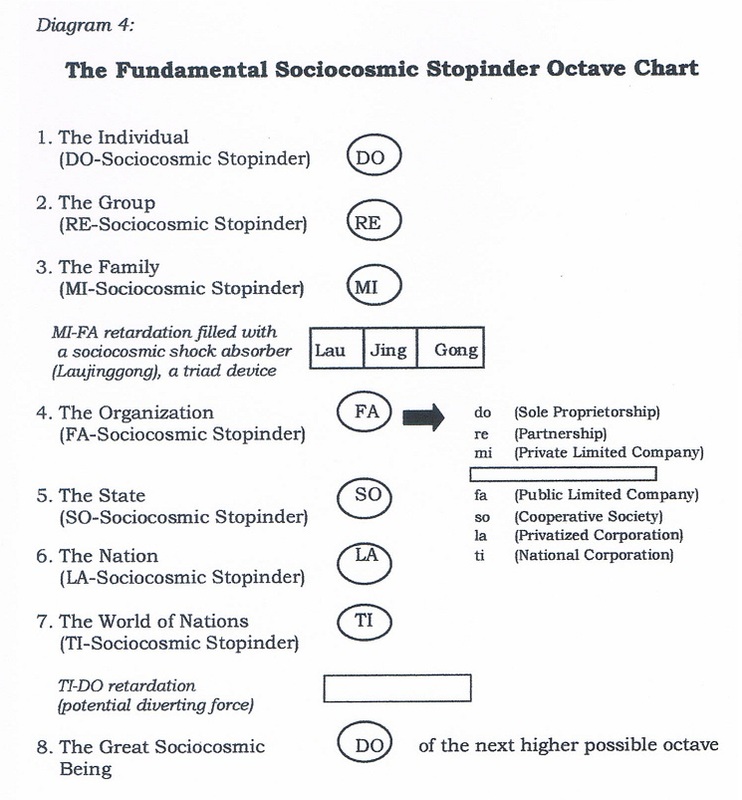 Our Sociocosmic Octave comes from the emergence of the homo sapiens sapiens (modern man) and develops as a relations of production amongst all the breeding and growing man. Our Technocosmic Octave emerges or ‘sponsored-to-act-as-a-means-or-instrument-of-production’ to man and his sociocosmic octave and also to support it. Just as man has four bodies (Minds, Head, Thorax and Abdomen) connected together to form the total man, so is the evolving and involving Great Body Biocsociotechnocosmic Being (or Organic Film) which must have 4 bodies or domains or dimensions or even groupings on a large scale to the size and thickness of the surface of mother Earth. As I have mentioned before, there were 4 great Technocosmic Revolutions or industrial revolutions possible for all the human sponsored technocosmic beings in our Great Biosociotechnocosmic Being, and that is the sponsored creation of their own four bodies by the homo sapiens sapiens themselves. "All perfected machines should have 4 bodies or distinct components; we called them the 1st body, the 2nd body, the 3rd body and the 4th body. Revolution in the objective sense will be the leap when each body is created. The addition of a physical body or "carriage" (1st body), the "engine" (2nd body), the "driver" (3rd body) and the "passenger" (4th body) will not impress you into seeing a sociotechnocosmic revolution until the creating and perfecting are sponsored on a large scale throughout the whole sociocosmos. Next comes the third technocosmic revolution, which witnessed the emergence of computers & IT and gradually perfected into artificial intelligence with intelligence inside. We the humans have created these thinking brains to be harnessed to the existing 1st and 2nd bodies as the 3rd body of the machines, and this again sociotechnocosmicalized to produce the effect of an IT revolution throughout the whole world. We are still perfecting (since the years 2000's) our 3rd Technocosmic Revolution en masse because each revolution must spread into the whole ‘Organic Film’ or the ‘Great Biosociotechnocosmic Body’ just as Capitalism of the sociocosmic octave needs to complete itself for this same Great Biosociotechnocosmic Body having also to co-exist with Socialism of this same octave that has been called into existence about the same time and after it by this same Capitalism itself. All the processes must cover the whole ‘Organic Film’ on mother Earth too. We are currently experiencing the global impact of INDUSTRY 4.0 and everyone seems to hear it from the social media, news, professionals, the statesmen, the businessmen, and many people from all walks of life. It is a new emergence of the technocosmic history - a new factory of SMART machines sociocosmicalized into a production entity that is linked in the cyber system and can do work together. It is a higher qualitative leap in the technocosmic development and a bud that will breed everywhere in suitable locations of the Great Biosociotechnocosmic Body. So it is important to know it. What is INDUSTRY 4.0 in the opinion of ‘Views From the Real World? Note that in Real World View terminologies, INDUSTRY 1.0 (1784) and INDUSTRY 2.0 (1870) are considered the 2nd Technocosmic Revolution en masse. 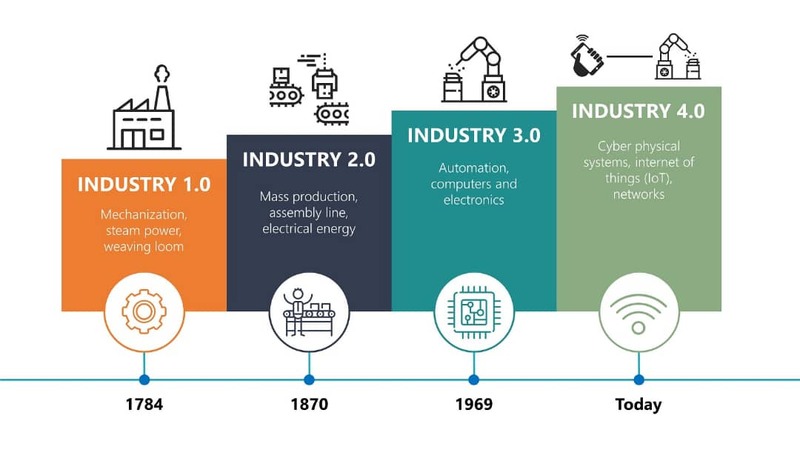 INDUSTRY 2.0 (1969) and INDUSTRY 4.0 (2018) are considered the 3rd Technocosmic Revolution en masse and with greater integration. The 4th Industry is still the 3rd Great Technocosmic Revolution at a higher stage of development. The 4th Technocosmic Revolution is currently truly primitive because, we want to involute for the machines the psychic factor or ‘souls’, the ‘I’s, the ‘it’s, the machine ‘I AM’ and the spirit or its ‘religions’, ‘philosophies’ and ‘ideologies’ which are currently found in the Fourth Body of the homo sapiens sapiens and not in the electricity, the psychicity or the quantum field in the bodies of the machines (land, marine or avians) or factories or buildings alike. We have connected them to us using our psyche (and life energies) as “theirs” …. We do not know why we are caught in this cosmic slavery which is partially propelled by the philosophy of wealth accumulation in the homo sapiens sapiens souls. But INDUSTRY 5.0 or INDUSTRY 6.0 could bring everything closer or enter into the new point of the 4th Technocosmic Revolution.